Laughter lines, crow's feet, dirty big wrinkles…whatever you call them, we all have them! I don't worry too much about them right now (they are there but I have bad eyesight) but I have to admit to wondering what I can do now (as I approach 40) to prevent them being more of an issue when I get older. 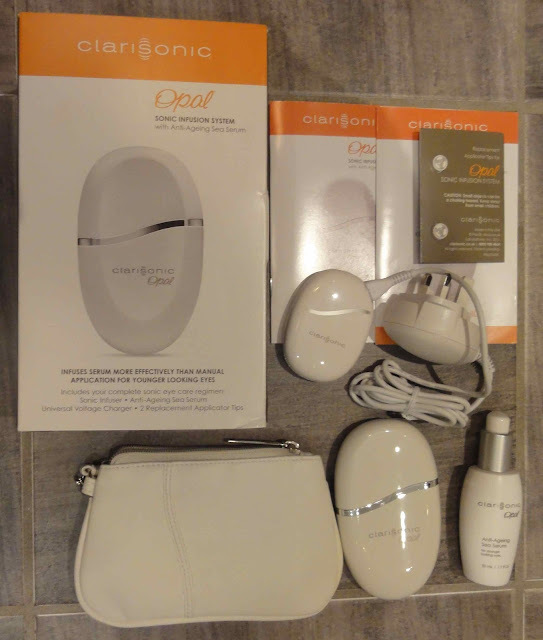 The box contained a pebble shaped Clarisonic machine, charger, carry bag, spare heads, full instructions and 50ml of Clarisonic Anti-Ageing Sea Serum, which is a clear, gel cream with little or no scent that promises to target wrinkles around the eye area. The instructions are to put a squirt of gel onto the head of the Opal (which is dipped and holds just the right amount of gel) and switch it on, while holding to the boned area around your eye - not near the eye. It vibrates for 30 seconds while you circle it and then switches itself off. Fool proof! The head is nothing like the cleansing Clarisonics - it's made of a very soft rubber so as not to damage the delicate skin around your eye. Updated to answer all the nail questions. My nails are Gelish dark plum with some glitter on the ring fingers. If you're based in Belfast, pop over to Bliss Nails on Facebook and ask to be friends. Only costs £10! But does it make a difference? Well, as an infrequent wearer of eye cream, I found this a much easier yet gentle way to apply it. The vibration literally leaves the skin around your eyes tingling. We all know the benefits of massage for releasing toxins and improving skin tone and it really feels like you've given this delicate area a little massage every time you use it. While the deeper wrinkles are still there, the skin around my eyes does look less crepey and my dark circles are not as obvious. Co-incidence or not, two different people on two separate occasions in the past week have told me I look younger! But for me, the key here is that his reluctant eye-cream user has found a fun yet effective way to look after the skin around my eyes and if I can prevent any more wrinkles developing, I'll happily take what I have so far into my 40's. In return for doing this review, John Lewis gave me a voucher to spend on some make-up for the Christmas season. I used it to invest in a John Lewis own brand eye-shadow brush, a liquid eyeliner from Rituals and Bobbi Brown Luminous Moisturising Foundation (seriously, THE best foundation out there). So tell me - have you ever used a Clarisonic, either a cleanser one or this Opal system for the eyes? I'd love to hear about your experience. Having used the Opal and read The Online Stylist's review of her Mia System, I'm wondering if the latter might make the perfect Christmas present…hint, hint! Disclaimer - The Clarisonic was provided to me to test, free of charge. Additionally, I was given skincare vouchers as a thank you for testing the product for 6 weeks. I was not paid to write this post - just asked to blog honestly about the product. I liked how it is actually different to the brush head of the big Clarisonic. Don't know about the Opal....but your nails are fierce!!!!!! OOoooo this is really interesting, I had no idea they even made this! 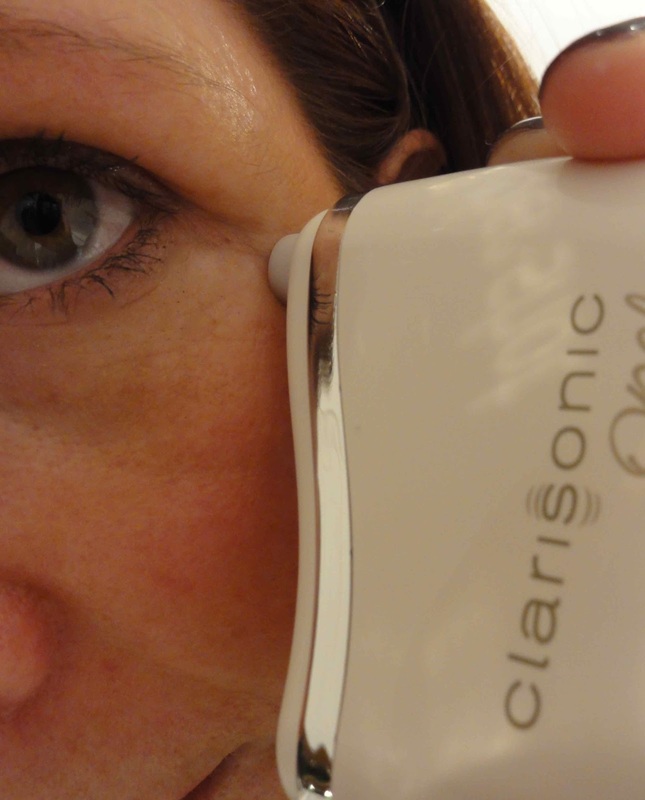 I still havent got round to trying the normal clarisonic which is a bit criminal for a beauty blogger. It looks good though and sure anything that makes putting on eye cream fabulous works a treat, also kudos on the foundation, great pick. Good on John Lewis! I haven't heard of this before but it sounds impressive. Loving the sound of the foundation too, must check it out! 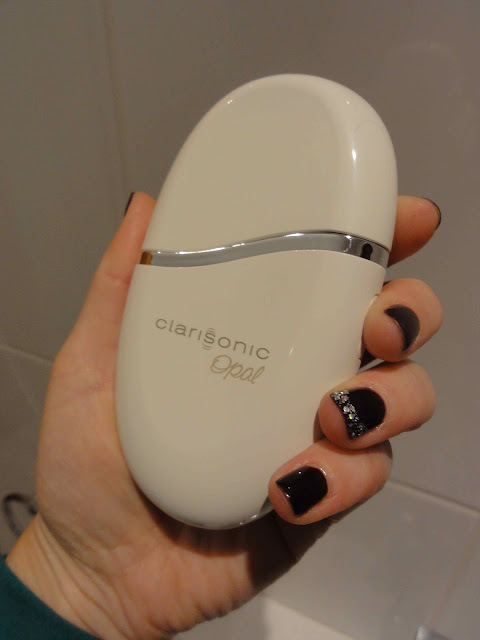 I was so tempted to get a clarisonic mia but my skin is so sensitive, every time I try something new it goes nuts! It's all about routine and habit and I can't begin to tell you about my lack of skincare routine - I'll die of shame if I have to. Thanks for reminding me that I do need to do something about my skin as approach the big 40 - bring it on, I'm excited already! I've heard of Clarisonic but didn't know they've ventured into eye as well. Anything that can banish fine lines that quickly is fabulous! 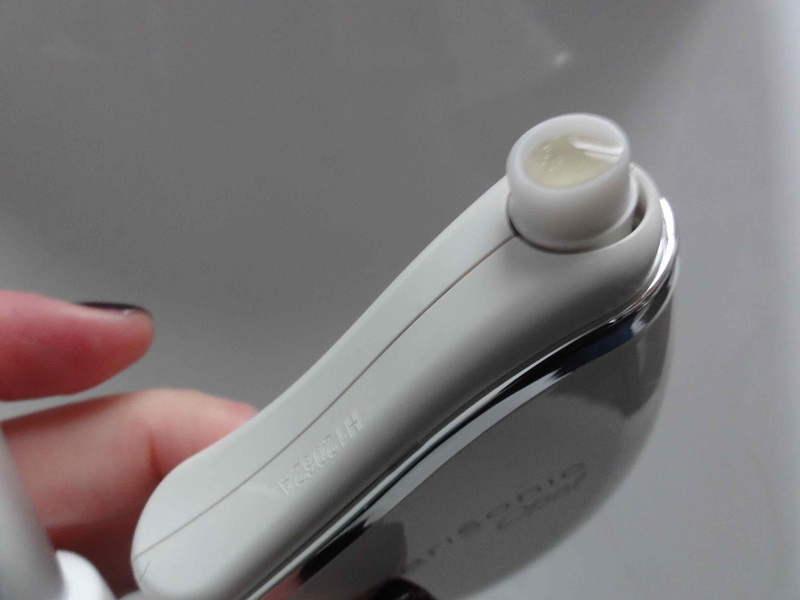 I have heard wonderful things about Clarisonic for the face, so this is really interesting! I too am in infrequent eye cream user, but could see myself using this. I need something like this - does it need much cleaning or anything where you put the gel in? I'm not getting any younger and my sisters keep making jibes about how wrinkly I am. I was thinking about investing in some creams but might take a look at this instead. Do they do instore demos? Woah, that's a really interesting product. I've never used the Clarisonic Mia, was always tempted but too scared of the whole skin purging phase. Interesting. Mid forties ... am I too late? :) Will definitely be investigating further. 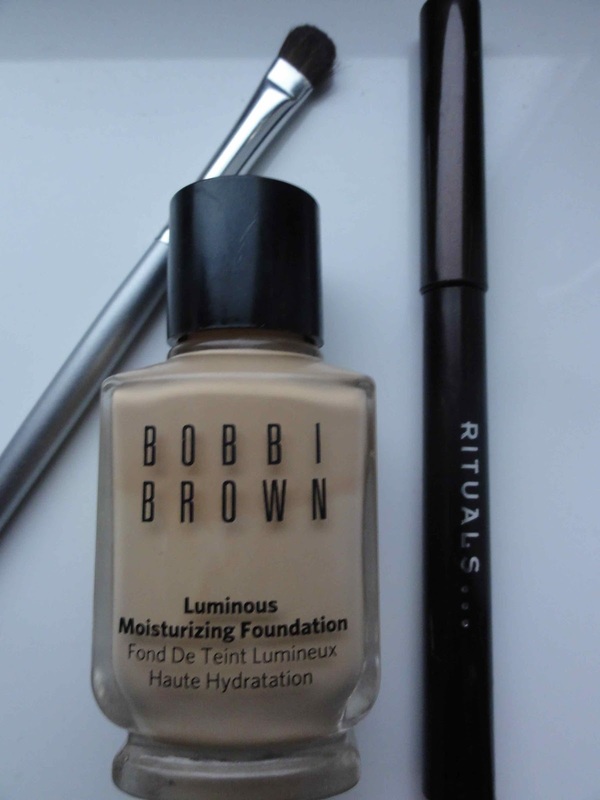 If it helps with dark circles, then consider me a convert! Nails are fab and very interested in the BB foundation. I've used her stuff for years & recently got the Long Lasting foundation, but I think it's a bit too 'make-uppy' looking, if that makes any sense? Must have a look at the Luminious Moisturising one. Great post - thanks for all the tips! Hi, Like d review but looove your nails! what shad? and love d sparkles! Fabulous post Avril...I could do with putting one of these on the Christmas wishlist! Need all the help I can get ... mind you the lines that have arrived are here to stay I think:( Have a lovely weekend! I'd love to see what it would do for my wrinkles! em.....this would not be for me...I kinda like my crows feet....I know "shock horror"....I am not that into correcting the lines on my face. But love the NAILS! !